Valentine's Day is nearing. Who is excited? 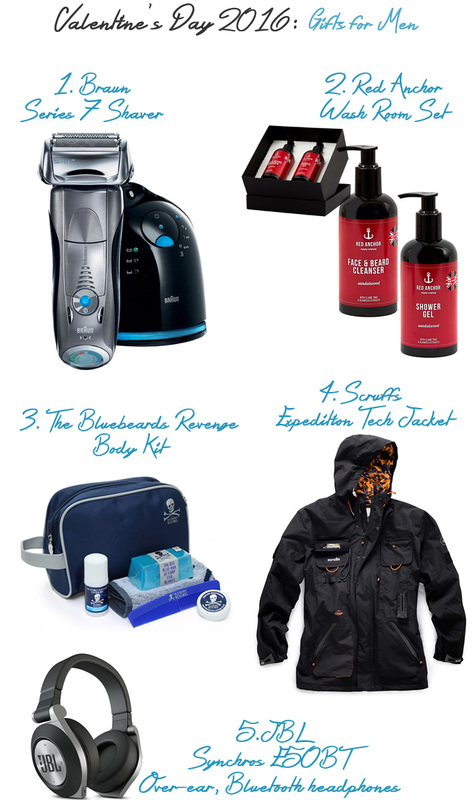 After featuring some gift ideas for the ladies, today I have listed down some wonderful products for men. Ladies, have a look. You might like one of my suggestions. Braun needs no introduction. They have an impressive range of premium shavers, all of which use innovative shaving technology. The Series 7 790cc-4 featured in this post is no different. It makes use of the Intelligent Sonic Technology (10,000 micro vibrations with every stroke) to capture more hair and offers a thorough and comfortable shave. Mr.H loves to be well-groomed and takes his skincare and shaving seriously. He loves electronic shavers and having used this Braun Series 7 model, it has zoomed right to the top of his recommended shavers list. And not without reason - the Series 7 790cc-4 has a pivoting shaving head that adapts to facial contours and its flexible cutting elements ensure that short and long hair are both cut with every stroke of the shaver. This means he achieves a close and comfortable shave each time. This model also comes with a clean & charge station which makes maintenance so much easier. The system automatically cleans, charges and lubricates the shaver to keep it like new - all of this at a touch of a button. Impressive, isn't it? Mr.H loves it and as might be expected, recommends this shaver. Red Anchor are makers of quality men's care products. They use the very best natural oils and extracts with active ingredients and their products are delectably fragranced. Red Anchor recently launched three gift sets just in time for Valentine’s Day. The gift sets include: The Gents Essential Shave Set, The Gents Essential Beard Care Set and The Red Anchor Wash Room Set. The Wash Room Set contains 250ml Sandalwood Shower Gel and 250ml Sandalwood Face and Beard Cleanser. The products come packaged in a black gift box which in spite of being minimalistic looks elegant. Both the products have a wonderful relaxing scent and leave the skin clean and fresh. This would make for a wonderful gift set for any man. The Bluebeards Revenge are a premium range of high-quality male grooming, shaving, hair styling and skincare products. They have everything from styling products to beard oils, moustache waxes to soaps, body washes, shampoos and conditioners, moisturisers and fragrances and even a range of accessories. Mr.H was introduced to the brand around 3 years back and he loves the high quality of their products. Bluebeards Revenge have a number of gift sets that would make excellent Valentine's Day gifts. One such is the Bluebeards Revenge Body Kit which contains 175g Big Blue Bar Of Soap For Blokes, 50ml Anti-Perspirant Deodorant, 20ml Cooling Moisturiser Sample, a comb and a flannel. All of this comes bundled in a spacious zip-up wash bag. This set is perfect to carry on travels or taking to the gym. And it is priced at only £24.99 making it a winner. Do check their website for some other interesting gift sets. This best-selling jacket from Scruffs has taped seams and a waterproof membrane offering ultimate protection from the rain when working outdoors. The jacket is loaded with pockets (9 of them) and lined with 3M Thinsulate. It has adjustable cuffs, hem and hood and also comes with a clear PU torch pocket. Mr.H loves this jacket and highly recommends it. This would make an excellent gift for the man who loves/works outdoors. This one is for the music lovers and is highly recommended by me. Mr.H gifted this to me a few months back and I am in love with these headphones. Not only are they stylish and contemporary in design but more importantly they offer excellent sound quality. Comfortable to wear with no pressure points, I find that I can use these headphones for longer duration than other headphones I have used in the past. Bluetooth technology allows wireless connectivity with phones, tablets and music players and the ShareMe™ feature allows you to stream music wirelessly to any other headphone that has ShareMe™. The headphones are priced at £119.00 but you will get them for a discounted price of around £90.00 on Amazon making them a good buy for the price. Great post, as I always seem to see a lot of posts for the women, but hardly any for men!